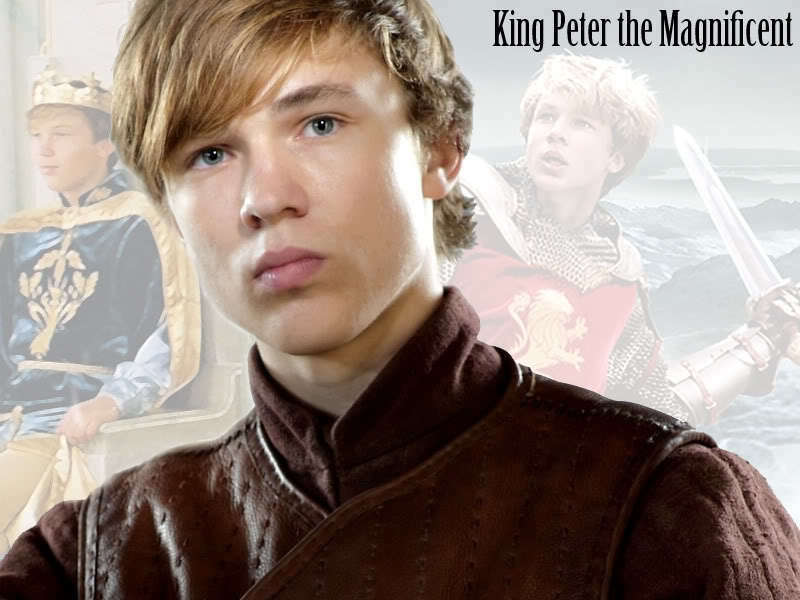 In keeping with the recent post on Peter Pevensie (AKA High King Peter the Magnificent – now there’s a title to live up to! ), which got me thinking again about my Hero and Everyman post, and also with the start of a brand-new season of NCIS:LA this week (yes, aside from figure skating – and by the way, you will probably have to suffer through a post or two on that this winter, because that’s just how I roll – the NCIS shows are the only television I really care about anymore. Although I am really, really curious about Once Upon A Time starting in October, given its fairy tale premise), I got thinking about the kind of hero that I have always been drawn to, both in literature and film (and television). Not necessarily the squeaky-clean, never had any faults (like Peter) hero, but the one who isn’t angsting all over the place, the one who is truly good, the one who knows what is right and strives to do it. Not so much the tortured anti-hero for me. One of my chief complaints about the LotR films was the changes they made to Boromir and Faramir’s characters – how they made Boromir, the weak one, seem more heroic, and turned Faramir, who was strong and just and good, into somebody who was weak and willing to do almost anything to earn his father’s approval. GRRR. I think that’s one reason I like Edmund so much in the Narnia books, because we get to see his journey from the most un-heroic beginning to a man who is confident in what is right, and acts upon it without much inner anguish or tortured questioning or intense struggles between what he wants and what he should do. 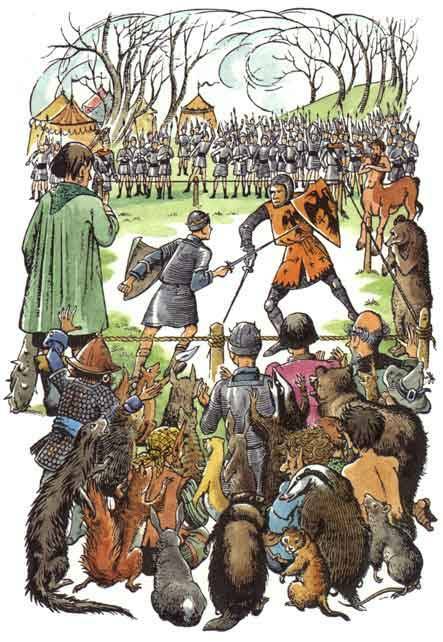 Taran, from Lloyd Alexander’s Prydain Chronicles, is another similar character – one who starts out with foolish ideas about what a hero is, and grows to be a quiet and unassuming hero of his own without even realizing it. This applies to heroines as well, of course. I have mentioned before about my fondness for Cecy and Kate of the Sorcery & Cecilia books by Patricia Wrede and Caroline Stevermer. There are two girls who are confident in what is right, and able to act upon it. Granted, their actions often stir up yet more trouble, but that just adds to the fun. And it’s not over-confidence, either – don’t get me wrong. I’m not a fan of the smug, or even the one who never questions. I think that’s why I liked Will so much in the first PotC movie – when his sense of rightness clashed with “the rules” he’d always lived by, he had to undergo a struggle to determine which was stronger – his instinct for justice, or what he’d always believed. Which made his decision in the end far more cheer-worthy. Or Sam, from NCIS:LA – though it tore at him to break away from NCIS in last season’s finale, to walk away from the structure he lived by, it was more important to help his friends (and save Hetty). If Callen hadn’t walked away first, would Sam have done so? I’m not sure, but once Callen did, Sam had to back up his friend and partner. And that is awesome stuff, and to me, the sort of thing that makes a hero (or heroine) truly interesting, and truly worth emulating. What sort of heroes do you prefer – the tortured ones, the ones suffering from a lot of inner angst, the anti-hero like Captain Jack Sparrow, or the simpler heroes, like Sam and Faramir, etc? I think there’s a lot to be said for all kinds, and I’m always interested to hear where other people differ from my preferences – it helps me broaden my writing repertoire as well as gives me stuff to chew on personally! Also, when it comes to Jane Austen heroes, am I the only one who thinks that Mr Darcy remains something of a bore even after his change, and that Mr Knightley is one of the greatest heroes in literature (I know Rockinlibrarian agrees with me on Henry Tilney’s swoon-worthiness, at least!)? This can’t be long, because I’m on my way out the door with husband, littles, and mother-in-law, on our way to a children’s museum, hurrah! But, something Joy said the other day planted a seed for a children’s picture book in my brain, and it has been growing ever since, and seems about ready to burst into full blossom. So I need your help, friends: What would a good name be for an imaginative little boy (about six years old) with a kind heart and a mischievous grin, who calls his mother Mummy and likes to ride his bicycle? And a hero without angst is like romance without kissing in the rain. Don’t mistake me: I think William Moseley is an excellent actor. And I thoroughly enjoyed his performance in The Lion, The Witch, And The Wardrobe. And taking Prince Caspian as a movie on its own merits, apart from the book, he played his role well. But he just wasn’t – couldn’t possibly be – High King Peter the Magnificent. King Peter, who tells the unsure and humble Prince Caspian (I also quite like Ben Barnes, but oh! his Caspian was almost as poor a representation of the book’s character as Peter) first thing “We haven’t come to take your throne, you know, but to put you in it.” Who never questioned Aslan’s choice in sending them back to England, then bringing them to Narnia only for a short time. Who loved deeply, and was not ashamed of it; who mourned deeply and was equally unashamed. Who was noble, and just, and courageous, pretty much everything a traditional hero of medieval literature was supposed to be – just look at Malory’s King Arthur, and the knights of the Round Table, sometime. And yes, I understand that all of those traits don’t translate well to a modern-day movie-going audience. Remember my old post on Hero and Everyman? It’s the Everyman most movies promote, not the Hero. Not anymore. People’s tastes have shifted. And that’s okay, for the most part, because Everyman is important, too – especially when, as Rockinlibrarian pointed out on that post, the Everyman does the heroic (SAM!). But still. We could have done with less angst – or with angst over a different matter. Instead of the selfish “me me me why did Aslan send me back I was king I want to be king again why doesn’t anyone take me seriously wahhhh,” it could have been more along the lines of “what happened to Narnia why are these interlopers here what do you mean the beavers are extinct they were my friends Narnia is in my blood and it is hurting which makes me hurt and England is cold and unfriendly and I can’t find my footing.” And then, of course, he could have learned while in Narnia how to search beneath the surface to find the warmth and joy that still existed, and to decide to seek out the same in England, which is why he was suddenly fit to return to England for good, because Narnia had taught him what he needed to know. You could even have worked in the tension between him and Caspian, if necessary – in that Peter has a hard time entrusting his land, his people (and trees, and Animals, and Others), to a descendent of those who silenced the land’s song to begin with, but in time sees that Caspian is different, and puts aside his prejudices to give the young prince a chance. Instead, we got stereotypes. Oh, we got stereotypes. And a very, very 2000s outlook from a character who lived in the 1940s. Which, I think, is what my frustration boils down to – it’s all very well and good to have a relatable character, but when you start acting like those characters live in this era, but still set them in a former, you’ve started to skew history, and project your own way of thinking backward, and nothing infuriates me more than that. So frustrating. Because Peter, as written, is a marvelous Hero, one to look up to, one to strive toward. After all, that was the point of the chivalric tales in medieval days, wasn’t it? To give people an Ideal? And I think it’s a shame that they tore that away from Peter in the movie and turned him into a sullen, resentful, bitter, stupid teenage boy. I know it’s a few years old now, but what did you think of the Prince Caspian movie? Does it bother you when movies change the inherent character of people in books? Do you think it is a mistake to impose today’s values and mindsets onto characters from past eras, to make them more relatable, or is that just a natural side effect of historical fiction (movie or book)? Do you mourn the lack of Ideal in today’s fiction? As I was working on my 1920s WIP the other day, I realized something important. This is not a YA story. The heroine and the hero, you see, have already come of age. Yes, the heroine is nineteen, but she is fully self-aware. The hero is in his mid-twenties. Both have lived through the War, both came of age during that time. This story is more about moving from young adult to fully adult, in the heroine’s case, and in the hero’s case – again, he’s already adult, and he is more learning just some good, healthy life lessons (like, don’t underestimate women – particularly one woman in particular!). So. This puts me in a quandary. Either I make some major changes – changes that would alter the entire story (set it before the War, when they are younger? Make the house party one hosted and attended by parental figures, instead of heroine’s personal friends? Keep it after the War and just have them live through it, instead of being personally involved? Somehow this is starting to sound like Muppet Babies or the like – take characters already established and just drop them in age) (did I seriously just make a Muppet Babies reference in this post? ), OR I drop the entire idea of YA and just accept that this is an alternate-history adventure-fantasy, end thought. I’m leaning toward the latter. Except I’m starting to panic, because everything that I’ve looked up in reference to agents and marketing etc has been YA. Are there other stories like this out there? Is there even a genre for alternate-history adventure-fantasy? (Outlander? I’ve never read any of the stories, but I have a vague idea those are somewhat similar) Do I go for the fantasy genre or the adventure/mystery genre? Do I cut out the fantasy along with the YA and just have it be a historical adventure? So many questions. One of these days I’m going to write something uncomplicated. How boring will that be! Have you ever gotten halfway through a project and realized it’s not what you had originally planned? Which is more important to you, sticking within your genre or sticking with your characters and plot? Do you think an alternate-history adventure-fantasy would have a market in the adult crowd? 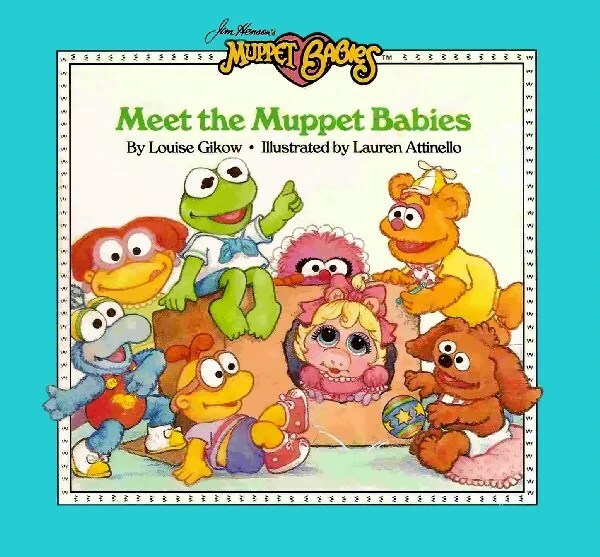 Did you watch Muppet Babies as a kid? I don’t know if I’ve mentioned here before our plan to teach our littles at home. Our main reason for this is that both Carl and I feel that a classical education, or some form thereof, is going to give them the best tools for learning and growing their entire life. And that is not something that one can find in any public schools, or even most private. I love the holistic way classical education works, showing how everything is interconnected, I love that it teaches how to learn, instead of just imparting facts, I love, love, love that it gives them Latin at a young age so that they have a good solid base for almost any other language they want to learn in later years. So. Yesterday I started preschool with Joy. It wasn’t in our original plan to do preschool at all – I have a rather Montessori approach to schooling for really little kids, in theory at least, that they learn best through unstructured play and exploring their world. But this isn’t about my absent-mindedness, although I suspect we’ll possibly have an episode like that every year. Joy is so happy to be “doing school” every day, and although I am emphatically not a natural teacher, I love seeing her blossom almost overnight with this new schedule. I even wrote out a goal list of things I want to see Joy accomplish this year – both academic and personal, because for me, school is about so much more than just training the mind, but about developing healthy lifestyle habits as well. Which is why “explore new ideas” is one item on the list, as well as “learn to write name,” “learn to count to 100,” and “learn to control temper” (I suspect that one will go on the goal list Every Single Year); and “skate forward and backward” (figure skating is our PE!) is right next to “learn music” (yes, that one is vague, but I’m still not sure what we’ll be doing for music. Joy insists she wants to learn banjo, but I’m thinking we might need to start with something more basic, first). Education! It’s so much more than readin’, writin’, and ‘rithmetic. Grace, I suspect, will be my Montessori kid, which also ought to be fun, especially once I’ve gotten used to Joy’s learning style and have to retrain myself all over again to figure out what works best for Gracie, but I am adapting as I need, and the reward of my kid’s beaming face as she finishes up the last of last year’s workbooks before starting the new is enough for me. Hope this wasn’t too boring for you all to read! I promise, I will do a writing-related post soon. How many of you sent your kids off to school this week, or started school at home? Were your kids excited or dreading the school year? If you do homeschool, do you follow a particular method, and if so, why? Are you super-impressed by my not-quite four-year-old’s ability to mostly color within the lines?